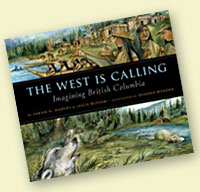 In 2007, I came up with an idea for a book that would celebrate BC's upcoming (2008) sesquicentennial (150th birthday). I wanted the book to be aimed at very young readers, but I needed help with the history part, so I pressed Leslie Buffam, an historian friend, into collaborating with me on the book. Basically, this meant that she did a ton of research, we decided on fourteen key scenes, I wrote the haiku and Dianna Bonder illustrated the text.